Tall Trees01485 542638work Bed & BreakfastWe have two very comfortable spacious en-suite bedrooms with their own sitting areas. One has a king size double and is on the first floor, the other is twin bedded and on the ground floor. Please note that these bedrooms are not in close proximity to each other and both have their separate entrances from the outside. If you wish for any further information please contact us. Both rooms have en-suite shower and toilet, hairdryer, hospitality tray with tea/coffee/hot chocolate making and fresh milk. For your entertainment there is a television with a DVD player, clock radio, Wi-Fi, magazines, books and playing cards. We can offer you a range of board games and you are very welcome to enjoy our garden which is regularly a part of our village Open Gardens weekend. Guests often enjoy drinking a glass of wine on the terrace next to the aviary on a warm summer’s evening. The RSPB’s Snettisham Reserve is a short drive away, as are several beaches and Natural England’s Dersingham Bog Nature Reserve – Deer, Owls, Nightjars etc.. It’s well worth a visit. Sandringham House and Gardens (usually open from Easter till beginning of November) offer a splendid day out and we are surrounded by lots of lovely countryside with pretty villages and many other attractions. 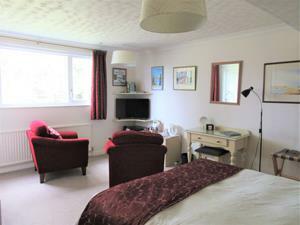 We have two very comfortable spacious en-suite bedrooms with their own sitting areas. One has a king size double and is on the first floor, the other is twin bedded and on the ground floor. Please note that these bedrooms are not in close proximity to each other and both have their separate entrances from the outside. If you wish for any further information please contact us. From King's Lynn take A149 to Dersingham. Take 1st right after Co-op Supermarket, into Post Office Road, then 1st right into Centre Vale. Tall Trees is on the corner of the second left (Centre Vale goes round to the left here). Take train to King's Lynn. Bus from King's Lynn to Dersingham.